What is your ideal shower? The true answer is actually it depends on what type of mood you are in. While the hot shower tends to be the default favorite for many people, especially after a long day of work when they want to relax or that morning shower to truly clean the dirt and grime off of them, what about hot summer days in the triple digits? In that case a cool or even a cold shower really hits the mark. 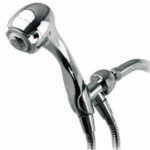 2.1 What are High Pressure Shower Heads? Beyond this, there is a major factor in the quality of a shower that is often ignored completely when looking at this question. What about water pressure? 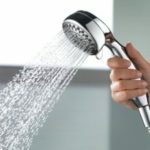 This often isn’t something people think about unless there’s too little for a fine spray, but adjusting the water pressure even a little bit in a shower can make the difference between a refreshing and relaxing experience that allows you to relax at the end of the day (or be energized in the beginning) or a shower that just doesn’t do much. If you’re feeling particularly dirty or sweaty, try turning up the water pressure just a touch. This makes it easier to scrub off all the dirt and grime, and that little extra bit of power can feel empowering while cleaning up. Some people have even found that a little bit of extra pressure in the morning seems to “push” them into waking up and getting on with their day. On the other side, a lighter bit of water pressure can be more helpful and relaxing and unwinding at the end of the day, especially if your default tends to be high pressure in nature. This is a delicate balancing act, and every person is a little bit different. Some people prefer really high water pressure while others like it just barely strong enough to cover them. Experiment to see what works best for you. Do you struggle with low water pressure in your shower? If so, did you know that you might not need to do something as drastic as upgrading your whole plumbing to improve the pressure? Often, you can fix shower water pressure problems simply by changing the shower head! Changing the shower head is an easy and cost effective way to get the powerful shower that you have always wanted. 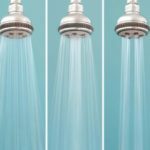 A lot of people mistakenly believe that you need to get a dual head shower in order to get the kind of pressure that they need, but that’s not always the case. You can usually get good pressure from a shower head that is designed to be used in a low water pressure environment. There are a lot of those available – and they can be quite affordable too. High pressure shower heads are heads that are designed to give more water pressure out of the same amount of water. Most shower heads will put out about 2.5 gallons of water a minute, with restrictors to prevent them from putting out more. Some people remove the restrictors to try to get more water throughput. Some people choose to buy adjustable heads that will allow them to set the pressure they want. Adjustable models work by compressing the water through fewer holes, while pressure chamber based models add air pressure to the shower head, to force more water through it more quickly. Both of these techniques can work pretty well. Air pressure tends to give pretty good pressure, and can work well if you like to take hot showers because thick streams of water coming through at comparatively high pressure will help you to feel more heat. A good, high pressure shower can even help you to feel cleaner. Instead of showering under a drizzle of water you will enjoy a deeper, nicer clean – it will rinse the water off you so you feel less slimy, and just in general feel better. 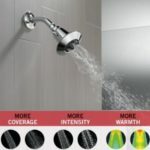 A good high flow shower head with multiple settings can be switched between gentle trickles, pulsating massages and a moderate power for rinsing. They are ideal for people who practice a lot of sports or work manual jobs, and who need the pressure to drive warm, comforting water into their skin. 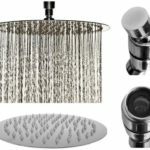 There are Top Two Hot Selling shower head with best water pressure on the market, one is Top rated Aqua Elegante with 6 different settings: Saturating Power Blast, Pulsating Massage, Gentle Rain, Water Saving, and 2 Mixed Modes. 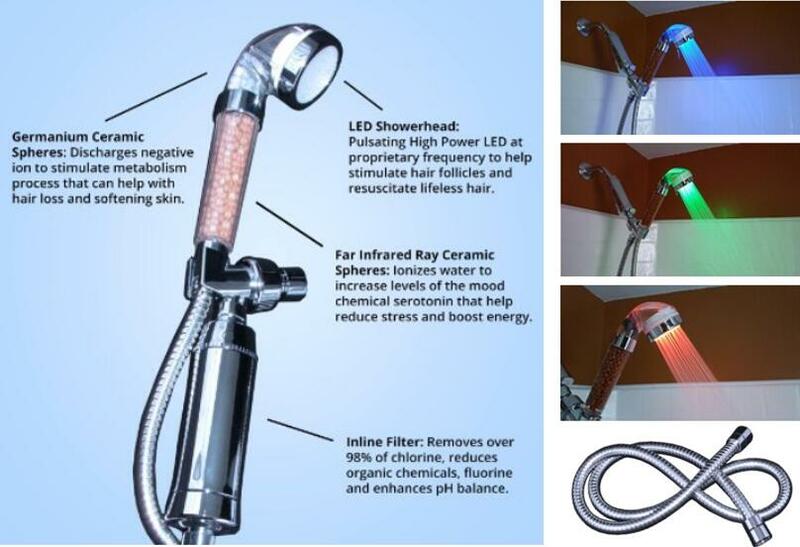 And the other one is Best selling Vida Cora revidalize your hair loss prevention filtered shower head system with pulsating LED. Choose one you like best!